Aluminum Expanded metal is a sheet product that has been slit and stretched to a wide array of diamond shaped openings. Aluminum Expanded metal offers savings in weight and metal, free passage of light, liquid, sound, and air, while providing a decorative or ornamental effect.One of the benefits from the manufacturing of expanded metal is that the sheet retains its structural integrity because it has not undergone the stress of having shapes punched in it (like perforated sheet), and the mesh-like pattern will not unravel (like woven mesh can do). Expanded metal has been stretched rather than punched, reducing scrap metal waste; making it cost-effective. 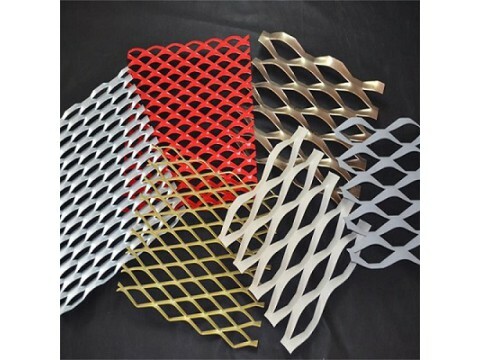 The main considerations when using expanded metal will be the chosen thickness and strand dimensions (weight and structural design requirements). Expanded metal can be almost transparent (depending on the opening); it has mechanical properties and is an excellent conductor.